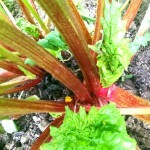 One of the considerable joys of community gardening is talking about food and swapping recipes. During tea break in the Outdoor Vegetable Crop production course I was facilitating, a student brought in a loaf of her homemade Irish soda bread so that we could taste the courgette and ginger jam she’d made. She also brought in copies of her bread recipe which I’m sharing with you now. 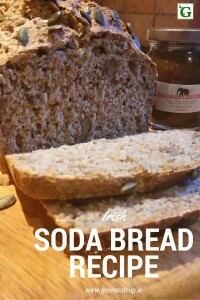 I don’t recall eating soda bread in the UK, but soon discovered how tasty it is with a chunk of cheese or a bowl of soup when we moved to Ireland; as a result of Colette’s recipe I also learnt that it’s incredibly easy to make. There’s no kneading or waiting for the bread to rise, just throw all the ingredients in a bowl, transfer to a loaf tin, pop in the oven and it’s done. 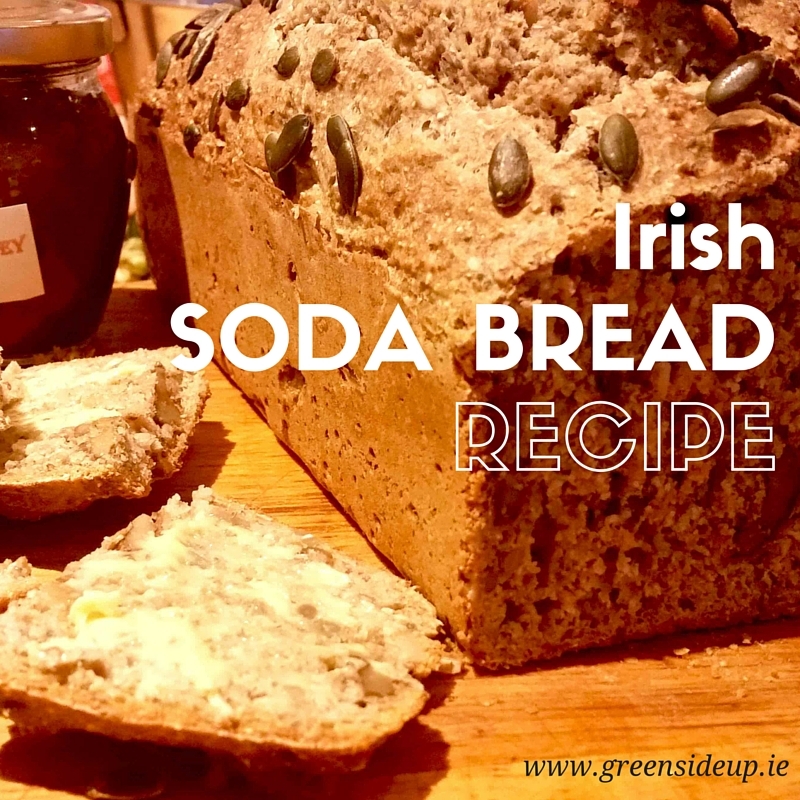 The traditional Irish bread soda recipe contains just four ingredients – flour, salt, buttermilk and bread soda but a few more bits and pieces have been added to this recipe. Like many hand-me-down recipes I’ve adapted Colette’s to suit the ingredients in my cupboard, adding various seeds and nuts and as a result it’s almost a meal in itself. You can leave out the seeds and add a small amount of wheat germ or oat bran if you prefer, making this easy brown bread recipe your own. Oil a 1lb bread tin (22 x 12 x 7 cm) and pre-heat the oven to 200ºC/400ºF. Place the flours, salt, bread soda and sugar into a large bowl and mix until evenly combined. 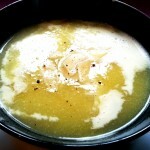 In another small bowl, add the egg, buttermilk and sunflower oil and whisk until fully mixed. 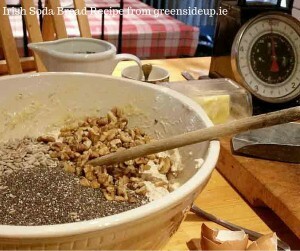 Make a well in the centre of the dry ingredients and add the wet, stirring with a wooden spoon or fork until fully combined, then add the seeds and nuts. The mixture will be quite sloppy. 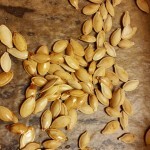 Pour the mixture into the prepared loaf tin, run a knife along the length of the mixture, scoring it, then sprinkle the remaining pumpkin seeds over the top of the loaf. Place in middle of the oven and bake for 60 minutes. Remove and cool on a wire rack. If you’d like to try making the green tomato and chilli chutney recipe that we enjoy tucking into with this Irish soda bread, you can find the recipe here. Hi Dee, We’ve never quite got it right with soda bread. As you say, very easy but ours was always “heavy” in the middle. Somehow I got into a conversation about soda bread with the lady in the cafe at Blackwater Garden Centre near Youghal a few months ago ( I tweeted a photo from the cafe) and the lady working there used to work in a bakery. They strategically placed the various bakes in large stone very hot ovens to be ready for the day’s customers in the morning. Apparently the trick to soda bread was to put it in at high temperature just before they switched the heating off and leave it in for an hour as the oven started to cool (I hope I’ve got this bit right as I’m writing this from memory). The point is, as you’ve got in your Method, it takes at least an hour. 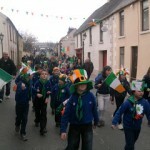 The bakery also found that the source of the flour was very important. The lady said after trial an error for home baking the best one is Odlums. We make our soda bread for Paddy’s Day and freeze enough to use over a few months until we need space for the excess new homegrown veg. It’ll be interesting to see if this works better. Any advice on fan vs conventional oven heating for soda bread? 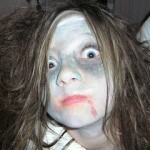 That’s a handy tip Noreen and useful to know, thank you. I’m feeling quite nervous about my next batch now in case it all goes wrong, though I’ve made around a half dozen loaves using this recipe.